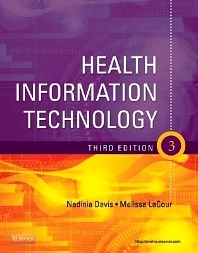 Reflecting emerging trends in today’s health information management, Health Information Technology, 3rd Edition covers everything from electronic health records and collecting healthcare data to coding and compliance. It prepares you for a role as a Registered Health Information Technician, one in which you not only file and keep accurate records but serve as a healthcare analyst who translates data into useful, quality information that can control costs and further research. This edition includes new full-color illustrations and easy access to definitions of daunting terms and acronyms. Written by expert educators Nadinia Davis and Melissa LaCour, this book also offers invaluable preparation for the HIT certification exam. Workbook exercises in the book help you review and apply key concepts immediately after you’ve studied the core topics. Clear writing style and easy reading level makes reading and studying more time-efficient. Chapter learning objectives help you prepare for the credentialing exam by corresponding to the American Health Information Management Association's (AHIMA) domains and subdomains of the Health Information Technology (HIT) curriculum. A separate Confidentiality and Compliance chapter covers HIPAA privacy regulations. Job descriptions in every chapter offer a broad view of the field and show career options following graduation and certification. Student resources on the Evolve companion website include sample paper forms and provide an interactive learning environment.